I love E3. Every year it resets my gaming calendar and gives me an idea of what at least 50% of my disposable down-time is going to look like for the next 12 months. Of course, I've never actually been to E3. That would be madness, as was clearly demonstrated by Polygon this year, who conducted all of their video interviews via Skype. Seriously, in these days of HD video streaming, why be there in person to see lots of things on screens when you can sit at home and watch them on a screen of your own? Sure, you might not be able to walk around and play pre-release versions of upcoming games, but I'm a bit shy when it comes to Early Access anyway, so I don't feel at any disadvantage watching all the coverage on Youtube. This wasn't just one of many surprises at Sony's conference, it was also a brand new IP with an inspiring post post apocalyptic setting that brought the recent I am Legend movie and Ninja Theory's Enslaved to mind. Lush vegetation, Massive Dinobot adversaries and a female protagonist. An utterly refreshing show. I never really got on with Doom 3. It looked fantastic at the time, but I found the survival horror stylings unnecessary and the endless monster closets tiresome. It was with great surprise then that I was impressed with this latest reinvention of the series. The action seemed smooth and solid, with a great number of gory melee takedowns to punctuate the gunplay. Easily one of the prettiest games of the show, in a sort of disturbingly brutal way. The timing of Avalanche's long-in-development Mad Max game is nothing short of fortuitous given the reception of George Miller's recent cinematic reboot of the franchise, Fury Road, for this is certainly no cynical merchandiing opportunity. George Miller was directly involved in it's conception and it definitely shows. I had hoped that the vehicles would take centre stage to distinguish this from other open-world games and indeed it seems as though the construction and customisation of the player's vehicle will not only form the backbone of the game design, but also inform many of the RPG-like choices along the way. Vehicular slaughter, Warboys, Sand. Mad Max is shaping up to be the full package. The original Deus Ex is one of my favourite videogames of all time, so I don't exactly need the hard sell when it comes to this series. In fact, I actively shied away from watching the 20+ minute long gameplay demo above. After 2011's Human Revolution I have absolute faith in Eidos Montreal to deliver a worthy (and possibly less golden) follow-up to one of the best games of the previous console generation. At the very least, the new 'DAWN' engine powering it looks like a significant step-up for the next/current gen installment. Another franchise that I'm particularly enamored with and a game that will ultimately sell me a PS4 by the time it's released next year. The E3 demo was especially impressive, showcasing a huge environment that puts some open-world games to shame, while delivering the kind of tight orchestrated scenario we've come to expect from Naughty Dog. With the writer of the first two games back on board, this is sure to be another great Uncharted game. Firaxis decision to focus on the PC version didn't help XCOM 2's profile at E3 - it was in fact so notable by it's absence that I had to trawl through Gamespot's video coverage to find anything on the game at all! It is one I'm especially looking forward to though - Enemy Within was my game of 2012 and I love how the setup for the sequel is predicated on the vast majority of it's fan's inability to complete the game on Ironman mode! Maybe dreams do come true, maybe Half Life 3 will come out one day and pigs might fly, these are all things that could be said in the context of Sony's big show opener, The Last Guardian, which many had consigned to the hell-pit of vaporware after it's many years of absense from E3. Rumours were also circulating that the project was now in the hands of PS4 designer, Mark Cerny, but this turned out only to be partly true. Original creator, Fumito Ueda was still very much on board and the the lengthy development time was further extended by the shift in architecture between PS3 and PS4. Luckily, it's pedigree seems to have remained intact and the game will finally see the light of day in 2016! Let's not hold our breath though! Arguably the most anticipated game of the show, with a reveal that both spearheaded and justfied Bethesda's own E3 showcase. 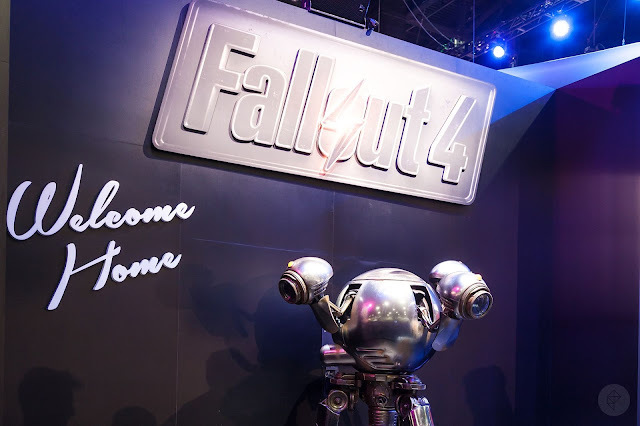 Fallout 4 had quite the unveiling, with demonstrations of the game's newly voiced protagonist, an unsurprisingly innovative take on character creation and a wealth of crafting opportunities. Also, for a game (at least mostly) set in a post apocalyptic wasteland, it seems really colourful! And in the biggest mic-drop moment of E3, Todd Howard announced the release date of Fallout 4 to be 10/11/15. Game over.